I love Unschooling, and the thing I love the most is that it can be as relaxed as I like it to be. I usually take the very relaxed approach because why make things harder than they need to be. We recently went to the beach and had an Unschooled class at the Beach. We had a lot of fun looking at the animal, birds, water, waves, shells, sand, people watching and hiked for miles as the cold water hit our feet. Luckily it was around 75 most days so the cold water was refreshing in the middle of winter. Unschooling is about asking questions and learning as you go, researching (if you like) those hard questions that all kids ask and finding more answers that hopefully lead your child to ask even more questions. My first advice let the kids lead the charge, ask a question or two and then let everyone just talk it out. We googled a lot of things right there on the beach and then some more things when we got home. Why is there a tides? How the moon effect the tides? Why are there different types of jelly fish? Why can’t we see a whale from the shore? Were do the shells come from? Why are the fish different colors? What is the evolution of the horseshoe crab? How much of the island will be underwater if there is a hurricane? What is the lighthouse used for? What makes the sand a certain color? Why do birds eat the eyes first of fish that float up on shore? Why are some birds huge and other so small? Did this rock pile used to be a dock for the fort on the island? Why can’t I bring my dog to the beach? Bring a bucket and collect 10 different things and lay them on the beach and try to find out what they are and remember your iPhone will come in handy for this project. Collect shells on the beach and stones by a river and make an art project with them by painting, decorating an item or just displaying them for the kids to look at later. Watch Netflix videos on the ocean, jellyfish or whales (for example). Museum near the beach, we have a small museum that kids can check out to learn more about all the sea creatures that live on or near the beach. Don’t forget to visit the beach in the summer and winter, high tide and low tide. You will find different sea life, animals, shells. 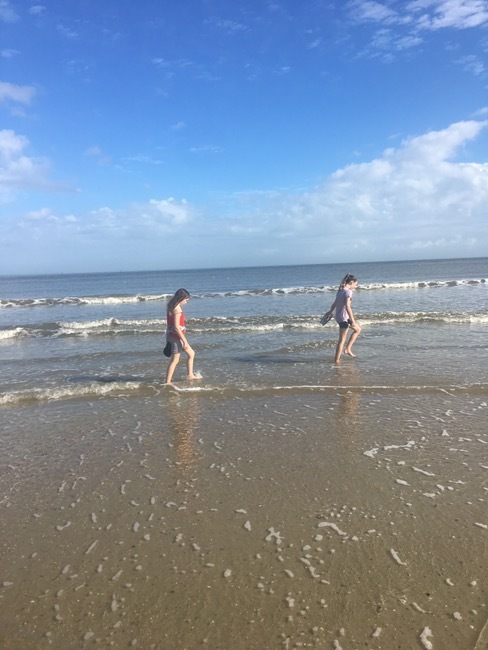 This entry was posted in crafts, science, summer activities, Unschooling and tagged ask questions, beach, great ideas, science, Unschool by Chrissie. Bookmark the permalink.